His first of three consecutive seasons topping the 70-goal plateau in 1989-90, Brett Hull would score a career-high 86 in 1990-91, the third-highest total in NHL history. 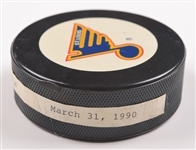 We have an important puck from Hull’s collection, with the example he used to score his 71st goal of the 1989-90 season. Taking place in a March 31st contest against Minnesota, the official InGlasCo Blues puck has a thin label, with typed particulars including “71 – vs. Minnesota March 31, 1990”. A signed LOA from Brett Hull will accompany. 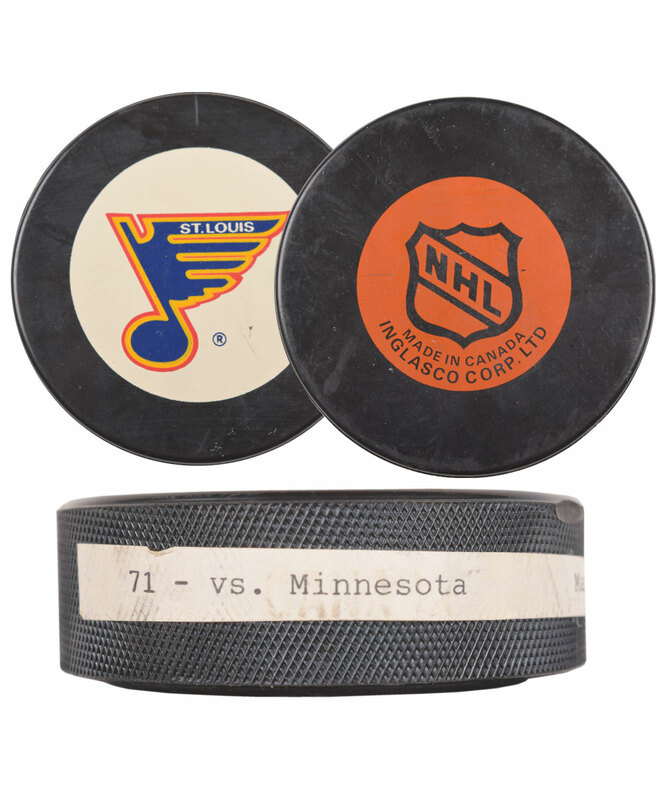 The puck feature’s clean InGlasCo and Blues logos, with just light overall wear. With 5 seasons of scoring 50 goals or more, Hull would conclude the 1989-90 campaign with 113 regular season points including 72 goals, with his 71st scored serving as his 145th regular season career goal, and second-to-last of the season.